A peptic ulcer in the stomach is called a gastric ulcer. One that occurs in the duodenum is called a duodenal ulcer. 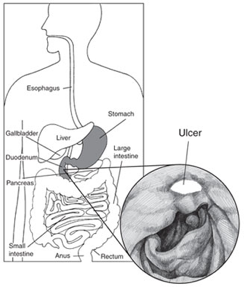 People can have both gastric and duodenal ulcers at the same time. They also can develop peptic ulcers more than once in their lifetime. A bacterium called Helicobacter pylori (H. pylori) is a major cause of peptic ulcers. Nonsteroidal anti-inflammatory drugs (NSAIDs), such as aspirin and ibuprofen, are another common cause. Rarely, cancerous or noncancerous tumors in the stomach, duodenum, or pancreas cause ulcers. Peptic ulcers are not caused by stress or eating spicy food, but both can make ulcer symptoms worse. Smoking and drinking alcohol also can worsen ulcers and prevent healing. H. pylori is a type of bacteria—a germ that may cause infection. H. pylori infection is common, particularly in developing countries, and often begins in childhood. Symptoms usually don’t occur until adulthood, although most people never have any symptoms. H. pylori causes more than half of peptic ulcers worldwide.2 The bacterium causes peptic ulcers by damaging the mucous coating that protects the stomach and duodenum. Damage to the mucous coating allows powerful stomach acid to get through to the sensitive lining beneath. Together, the stomach acid and H. pylori irritate the lining of the stomach or duodenum and cause an ulcer. Yet, most people infected with H. pylori never develop ulcers. Why the bacterium causes ulcers in some people and not in others is not known. Most likely, development of ulcers depends on characteristics of the infected person; the type, or strain, of H. pylori present; and factors researchers have yet to discover. How is H. pylori spread? Researchers are not certain how H. pylori is transmitted, although they think it may be spread through contaminated food or water. People may pick up the bacterium from food that has not been washed well or cooked properly or from drinking water that has come from an unclean source. Other research is exploring how infection spreads from an infected person to an uninfected person. Studies suggest that having contact with the stool or vomit of an infected person can spread H. pylori infection. And H. pylori has been found in the saliva of some infected people, which means infection could be spread through direct contact with saliva. weight loss, poor appetite, bloating, burping, nausea and vomiting. Some people experience only mild symptoms or none at all. How is an H. pylori-induced ulcer diagnosed? If a patient has peptic ulcer symptoms, the doctor first asks about use of over-the-counter and prescription NSAIDs. Patients who are taking an NSAID are asked to stop, reduce the dose, or switch to another medication. Then the doctor tests to see if H. pylori is present. Testing is important because H. pylori-induced ulcers are treated differently than ulcers caused by NSAIDs. Doctors use one of three simple, noninvasive tests to detect H. pylori in a patient’s blood, breath, or stool. Because the breath test and stool test more accurately detect H. pylori than the blood test, some doctors prefer to use one of these two tests. Each test described below is easily performed, often in an outpatient setting such as a doctor’s office or lab. Blood test. A blood sample is taken from the patient’s vein and tested for H. pylori antibodies. Antibodies are substances the body produces to fight invading harmful substances—called antigens—such as the H. pylori bacterium. Urea breath test. The patient swallows a capsule, liquid, or pudding that contains urea “labeled” with a special carbon atom. After a few minutes, the patient breathes into a container, exhaling carbon dioxide. If the carbon atom is found in the exhaled breath, H. pylori is present, as this bacterium contains large amounts of urease, a chemical that breaks urea down into carbon dioxide and ammonia. Stool antigen test. The patient provides a stool sample, which is tested for H. pylori antigens. If a patient has any alarm symptoms, the doctor orders an endoscopy. Many doctors also recommend this tests for patients who first experience peptic ulcer symptoms around age 50. Often performed as outpatient procedures in a hospital, both procedures are painless and allow the doctor to look inside the patient’s stomach and duodenum.. The doctor can use the endoscope to take photos of ulcers or remove a tiny piece of tissue—no bigger than a match head—to view with a microscope. This procedure is called a biopsy. The biopsied tissue is examined to see if H. pylori is present. If an ulcer is bleeding, the doctor can use the endoscope to inject medicines that help the blood clot or to guide a heat probe that burns tissue to stop bleeding—a process called cauterization. How is an H. pylori-induced ulcer treated? Peptic ulcers caused by H. pylori are treated with drugs that kill the bacteria, reduce stomach acid, and protect the stomach and duodenal lining. Antibiotics are used to kill H. pylori. Antibiotic regimens may differ throughout the world because some strains of H. pylori have become resistant to certain antibiotics—meaning that an antibiotic that once destroyed the bacterium is no longer effective. Doctors closely follow research on antibiotic treatments for H. pylori infection to know which treatment strategy will destroy which strain. PPIs suppress acid production by halting the mechanism that pumps acid into the stomach. H2 blockers work by blocking histamine, which stimulates acid secretion. While PPIs cannot kill H. pylori, research shows they do help fight the H. pylori infection. Research also shows that after 4 weeks of treatment, patients taking PPIs had earlier pain relief and better healing rates than those taking H2 blockers. Bismuth subsalicylate (Pepto-Bismol) coats ulcers, protecting them from stomach acid. Although bismuth subsalicylate may kill H. pylori, it is used with—not in place of—antibiotics in some treatment regimens. In the United States, clarithromycin-based triple therapy—triple therapy, for short—is the standard treatment for an ulcer caused by H. pylori. The doctor prescribes the antibiotic clarithromycin, a PPI, and the antibiotics amoxicillin or metronidazole for 10 to 14 days. Because research shows higher cure rates with 14 days of treatment, some doctors now prescribe triple therapy for this longer period. Patients should discuss any bothersome side effects with their doctor, who may prescribe other medicines to kill the bacteria and cure the ulcer. Although antibiotics can cure 80 to 90 percent of ulcers caused by H. pylori, eliminating the bacteria can be difficult. Patients must take all medicines exactly as prescribed, even when the peptic ulcer pain is gone. At least 4 weeks after treatment, doctors test patients using a breath or stool test to be sure the H. pylori infection has been cured. Blood tests are not useful after treatment because a patient’s blood can test positive for H. pylori even after the bacteria have been eliminated. If infection is still present, ulcers could recur or, less commonly, stomach cancer could develop. Thus, some patients need to take more than one round of medicines to kill the H. pylori bacteria. Bismuth quadruple therapy is one of several treatments used after initial treatment has failed—a strategy called “rescue” or “salvage” therapy. In the second round of treatment, the doctor prescribes different antibiotics than those used in the first round. Amoxicillin, however, can be used again to treat H. pylori infection because H. pylori resistance to this antibiotic is rare. Can antacids or milk help a peptic ulcer heal? An antacid may make the ulcer pain go away temporarily, but it will not kill H. pylori. People being treated for an H. pylori ulcer should check with their doctor before taking antacids. Some of the antibiotics used to kill H. pylori may not work as well if combined with an antacid. People used to believe drinking milk helped peptic ulcers heal. But doctors know now that while milk may make an ulcer feel better briefly, it also increases stomach acid, which can make ulcers worse. Patients should talk with their doctor about drinking milk while an ulcer is healing. Most peptic ulcers are caused by H. pylori. Use of NSAIDs—such as aspirin and ibuprofen—is another common cause. Neither stress nor spicy food causes ulcers. Smoking or drinking alcohol, however, each can worsen ulcers and prevent their healing. A combination of antibiotics and acid-reducing medicines is the most effective treatment for H. pylori-induced peptic ulcers. Testing after treatment is needed to be sure the H. pylori infection is gone.